There are some ideas which when viewed retrospectively sound obvious. For example, when Percy Shaw invented cats eyes in 1934 to help people drive in foggy conditions, nobody seemed much interested, till future Prime Minister Jim Callaghan took them up for British roads in 1947 – and they became ubiquitous. What On Track and Southern Railways are doing seems simple. In fact it’s a forehead slapping no-brainer. It’s the idea of linking the way you get to a place – the railway – with what you are going to do there, i.e visit The Brighton Festival. This, after all, is a festival with a growing reputation internationally and a flagship event for Brighton. 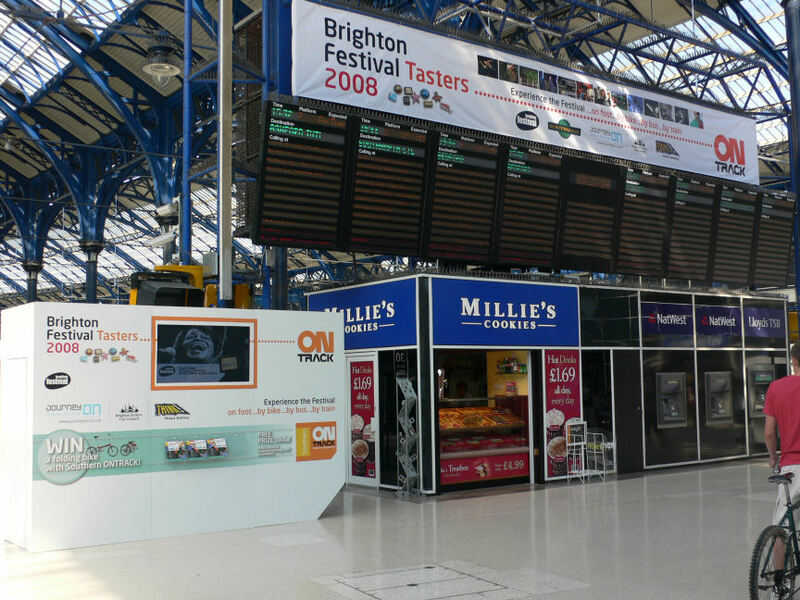 And the modest booth pictured at Brighton Station is the first step in making this link explicit. It the beginning of an attempt to join the dots between travel, sustainability and your destination. On Track are trying to promote the fact that simply by choosing to board a train rather than drive, you are actually doing something good for the planet. You can zoom down from London to Brighton knowing that you’ve a mouse’s carbon footprint. Crucially, you are already making a difference. This is important. There is nothing more paralysing than guilt and hopelessness. Show people the everyday things they can do to make a difference, and pow! you have begun to nudge people towards a tipping point in their behavior. And Brighton, of course, is one of the most sustainably minded cities in the UK, (don’t take my word for it, have a look at this interview I did with Thurstan Crockett Brighton’s sustainability guru). The Festival is part of the Brighton sustainability mix. This entry was posted in Uncategorized and tagged Brighton, On Track, Percy Shaw, Rail travel, Southern, Southern On Track, Southern Railways, Sustainability, The Brighton Festival, Thurstan Crockett. Bookmark the permalink.